1966: Peyton Place's Steven prepared for his weddding. 1981: Another World's Sandy took care of Mac after an explosion. 1986: Santa Barbara's Kelly confessed to Nick before their wedding. 1989: Days of our Lives' Steve and Kayla became Gideon and Emily. 1966: On Peyton Place, Betty Anderson (Barbara Parkins) and Steven Cord (James Douglas) prepared for their wedding. 1976: On Another World, Emma Frame (Tresa Hughes) urged Russ Matthews (David Bailey) not to drag the police into Sharlene's disappearance. 1978: On One Life to Live, country singer Bill Anderson made his first appearance as the fictional Bill Anderson, a part he would play off and on for a few years. Aldo, being blackmailed by Brad Vernon, attacked Cathy in an attempt to get the ring off her finger outside the free clinic. "I was a fish out of water when I was first hired to be on the show," Anderson blogged in 2010. "But Phil [Carey] and Clint [Ritchie] and Bobby Woods and Erika Slezak and Judith Light and others went out of their way to be extremely nice to me. Yes, the same Judith Light who was in her last days of doing daytime drama when I joined the cast, and who later went on to sitcom and movie success in California. She could cuss like a parrot on steroids, but never has anybody been more gently encouraging to someone than Judith was to me." 1980: On The Edge of Night, Dr. Gault lied to Draper (Tony Craig) about Draper being Kirk Michaels. 1981: On Another World, Mac (Douglass Watson) and Sandy (Christopher Rich) arrived to to warn Jamie (Richard Bekins) just as the bomb exploded in Mac's office. Later, Sandy called Mac "Dad" as he cradled him in his arms. 1982: Days of our Lives star Brenda Benet (Lee Dumonde) took her own life by a self-inflicted gunshot wound at age 36. Benet's Days of our Lives co-stars Bill and Susan Hayes reflected on Benet in our 2010 interview. Read it here. Read a newspaper article about Benet's suicide here. 1986: On Santa Barbara, Kelly (Robin Wright) told Nick that she slept with Dylan, who canceled their wedding. Elsewhere, Madeline Laurent (Terry Davis, in her final appearance) was deemed to be brain dead. 1986: On Knots Landing, Abby (Donna Mills) feared Olivia (Tonya Crowe) would commit suicide. 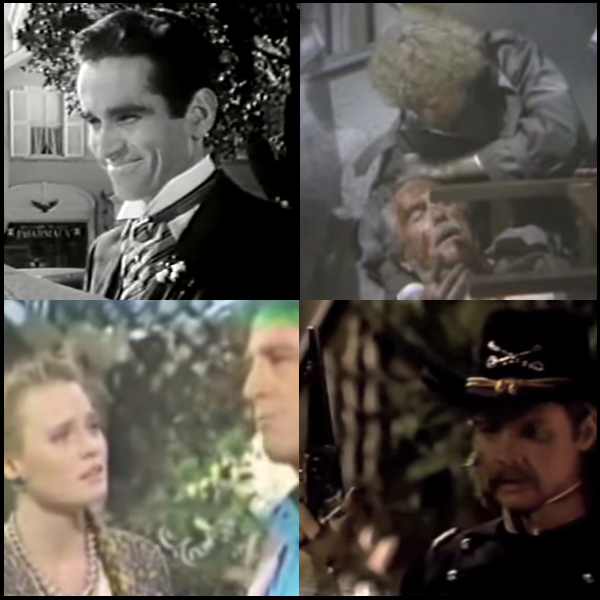 1989: On Days of our Lives, staying at the mansion Nick gave them, Steve (Stephen Nichols) and Kayla (Mary Beth Evans) found the Civil War-era diary of southern belle Emily, and they began reading the love story between her and Union officer Gideon. 1997: On Sunset Beach, Paula Stevens (Laura Harring) took samples of Elaine's (Leigh Taylor-Young) hair to be tested against hair found at the murder scene. 2009: On General Hospital, Jason (Steve Burton) ran into Robin (Kimberly McCullough), who was dealing with postpartum depression. Later, Patrick (Jason Thompson) found them in an embrace.